John Kotelawala Vidyalaya teacher who assaults student ... enjoys 2 years in prison! enjoys 2 years in prison! A school lady teacher who assaulted a schoolboy with hands on his head and face was found guilty and she was sentenced to two years rigorous imprisonment as a result by Kurunegala High Court Judge, Mrs. Menaka Wijeysundera yesterday (1). Apart from the jail term the fine of Rs. ten thousand imposed on her is not paid, the High Court lady magistrate said that she will have to undergo another jail sentence of a further three months and further ordered her to pay a compensation of Rs. one lakh to the prejudiced party. was the guilty party in this instance. Action was filed at Kurunegala High Court against this lady teacher for having assaulted an 18 year old child by the name of I.M. Chathura Sri Lalitha in the classroom on July 9th or on a date of proximity in the year 2011. As a consequence of a blow dealt on the head and face, medical reports indicated that a serious condition leading to an accident to the life of the child was specified. State Counsel Mr. Charaka Dharmasiri directed evidence for the petitioner while Attorney-at-Law Mr. Sudath Wijeywickrema appeared on behalf of the petitioner. Judicial Medical Officer of Kurunegala Teaching Hospital Mr. N.A.C.P. Chaminda who forwarded the medical report of the victimised child was summoned to provide evidence in this connection. The High Court lady magistrate who took into consideration all evidence and relevant factors provided by both parties finally gave the verdict that the said teacher was guilty in this instance. Police Sergeant Mr. Jayatilleka (19705) appeared on behalf of Kurunegala Police. 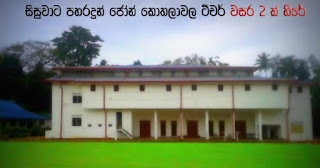 It was from this Kurunegala John Kotelawala Vidyalaya that the incident of a schoolgirl committed suicide after writing a letter over an incident where she was reprimanded with obscene words by the principal in 2014, 5 years before this.